Typically a smile on the face of an African disappears when a camera comes out. It’s just part of their culture — not smiling in photos. 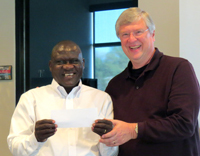 But Simon Pierre Nadjilao, president of the Grace Brethren Churches in the Central African Republic (CAR), could not contain himself as a symbolic check was handed to him recently in the Atlanta offices of Encompass World Partners, the Grace Brethren cross cultural church planting organization. The check represented gifts from the American church to help relieve some of the recent suffering of the African church as a result of the intense conflict in the CAR this past year — a reminder to the churches in the CAR that they are not alone. The “You Are Not Alone” campaign was started when Dave Guiles asked church leaders in the CAR how American congregations could help. The African churches are gathering offerings to send to the families that are suffering the most, but the needs are much greater than what they can handle. The church leaders suggested an idea of the American church helping fund the purchase of seeds and clothes that would be packaged in a sacks and distributed to the churches. Grace Fellowship Church, a Grace Brethren congregation in Pickerington, Ohio (Keith Minier, pastor), helped produce videos and materials to help get the word out and over $25,000 has been given to the project. From Encompass World Partners: Thank you to all who have given! We are moved by your concern and generosity just as Simon Pierre was so greatly moved. The conflict continues and the door remains open for those who want to continue to help. Click here to give: (http://www.encompassworldpartners.org/CAREmergencyrelief). And please continue to pray for our African brothers and sisters who continue to face great challenges.